September 2018 was very hot and dry across most of Georgia, with both daytime maximum temperatures and nighttime minimum temperatures several degrees above normal. Preliminary estimates indicate that Georgia’s September mean temperature will be one of the hottest on record. Rainfall in most of the state was below normal except for the northwest corner of the state and a small area along the eastern border. This led to the development of moderate drought by the end of the month. 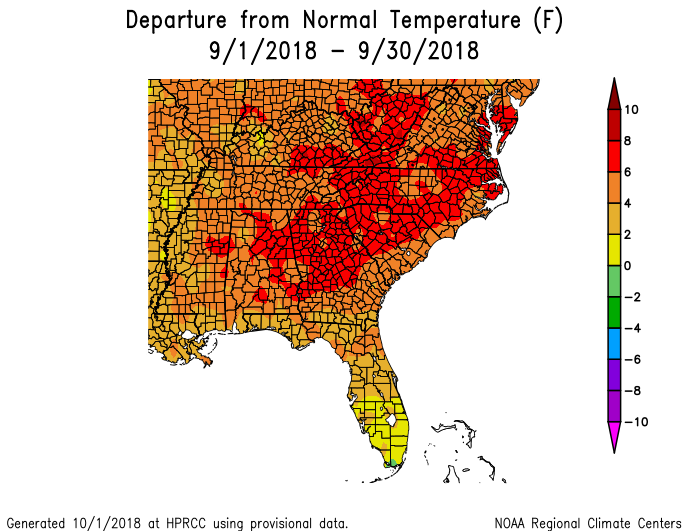 In Atlanta, the monthly average temperature was 81.0 degrees F (7.4 degrees above normal), in Athens 79.9 degrees (6.6 degrees above normal), Columbus 82.6 (6.0 degrees above normal), Macon 82.1 (7.1 above normal), Savannah 81.8 (4.9 above normal), Brunswick 83.5 (5.4 above normal), Alma 82.0 (4.9 above normal), Augusta 81.4 (6.8 above normal), Albany 83.6 (5.9 above normal), Rome 79.5 (7.5 above normal), and Valdosta 81.0 (3.5 degrees above normal). All of these stations except Rome, Macon, and Savannah were warmer in September than they were in July, which is normally the warmest month. Macon reported a new record high of 100 F on September 18, breaking the old record of 99 F set in 1931, and tied high temperature records of 98 and 96 F set on September 17 and 26, respectively. Savannah set a new record high minimum temperature of 77 F on September 17, breaking the old record of 76 F set in 1996. Alma broke record high minimum temperatures of 77 F on September 15 and 17, breaking the old values of 75 F set in 1999 on both dates. Brunswick reported a new record high of 92 F, breaking the old record of 91 F set in 2016 on September 19 and 94 F on September 28, breaking that date’s record of 93 F set last year. Brunswick also broke the record high minimum temperature on September 28 with a high minimum of 79 F, breaking the old record of 87 set in 1999, and on September 5 with 81 F, breaking the old record of 80 F set in 2002. The NWS noted that this was only the 4th time a minimum temperature of higher than 80 F was observed in Brunswick in September since records began in 1948. Many stations reported more days above 90 F in September than in the entire climatological summer (June through August). Nighttime temperatures never dropped below 60 F in a number of locations and many locations set new records for highest average minimum temperature during the month. 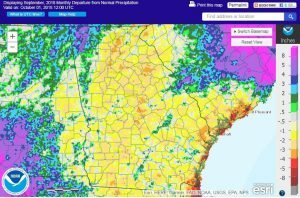 The number of hours with dew point temperatures above 70 F also set records at a number of locations around the Southeast, adding to the muggy conditions that kept nighttime temperatures high even though precipitation was below average. Precipitation was below normal in most of Georgia in September 2018. The highest monthly total precipitation from National Weather Service reporting stations was 9.08 inches in Rome (5.67 inches above normal) and the lowest was in Albany with 0.50 inches (2.94 inches below normal). Atlanta received 1.48 inches (2.99 inches below normal), Athens received 1.75 inches (2.19 inches below normal), Columbus 6.50 inches (3.44 above normal), Macon 1.02 (2.57 below normal), Savannah 2.10 inches (2.48 below normal), Alma 6.15 inches (0.82 above normal), Brunswick 4.74 inches (0.66 above normal), Augusta 7.19 (3.97 above normal), and Valdosta 3.43 inches (1.21 below normal). Columbus reported 3.07 inches of rain on September 25, breaking the old daily record of 2.88 inches set in 1956. 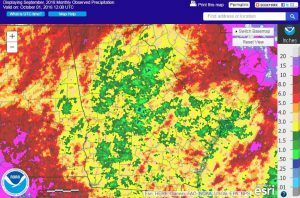 The highest daily rainfall total from CoCoRaHS observers in September was 6.57 inches observed near Sugar Valley in Gordon County on September 25, followed by 5.80 inches measured east of Summerville in Chatooga County on the same day. The highest monthly amount was 12.74 inches measured by the Sugar Valley observer, followed by 10.93 inches measured by an observer near Tunnel Hill in Catoosa County. The hot and dry conditions led to the development of moderate drought in parts of Georgia in September. By the end of the month, nearly 7% of the state was experiencing drought conditions and 29% was experiencing abnormally dry conditions according to the National Drought Monitor. It was a very quiet month for severe weather, with only four days that had any reports of wind damage. No tornadoes or hail were reported in the month. The only day with a significant number of wind damage reports was September 27, with scattered strong thunderstorms developing in the warm sector ahead of a cold front. Georgia was largely spared from impacts from both Tropical Storm Gordon, which passed to the southwest, and Hurricane Florence, which passed to the north, although some rain and breezy conditions were felt near the centers of circulation and strong surf and high tides were seen along the coast with Hurricane Florence. Wet conditions early in the month caused problems with fungal diseases on some crops and difficulty getting into the fields for some producers. However, the hot and dry conditions that occurred for most of September initially helped producers dry down hay but stopped the growth of pastures by the end of the month, forcing farmers to feed hay to livestock. Dry conditions stunted the growth of dryland crops like peanuts and soybeans nearing harvest, reducing yields and forcing farmers to increase water use on irrigated crops. Peanut farmers reported that the ground was so dry they were having a hard time even digging to check on the maturity of their peanuts and that the hard ground was making it difficult to dig them up. The dry conditions also decreased the yields of pecans and cotton. The outlook for October shows that above normal temperatures are likely to continue for at least the first two weeks of the month, while precipitation shows no trend towards above or below normal amounts. Because of the warm temperatures, drought expansion is expected in the next month. For the October through December period there is no expected trend towards cooler or warmer temperatures but a slightly increased chance of wetter than normal conditions in the southern part of the state. For more information please see the “Climate and Agriculture” blog at https://site.extension.uga.edu/climate/. We are now also on Facebook at SEAgClimate and on Twitter at @SE_AgClimate. Please feel free to email your weather and climate impacts on agriculture to share on the blog to pknox@uga.edu.